Wilson Audio introduces Sasha W/P Series-2 | What Hi-Fi? Utah-based manufacturer unveils latest descendant of iconic WATT/Puppy loudspeaker at CES 2014. Utah-based Wilson Audio has announced the launch of the Sasha W/P Series-2 – the latest descendant of the manufacturer's iconic WATT/Puppy speaker. 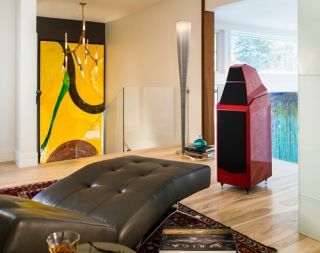 Features include the Wilson Convergent Synergy Tweeter, which transformed the sound of the company's Alexandria XLF and has now been modified for the Sasha's two-cabinet configuration. A new Sasha woofer enclosure has been developed by Wilson Audio that will reduce cabinet resonances by nearly 30%, while there are now also separate tweeter and midrange grills. It is thought the Sasha W/P Series-2 will be available from late February at a price of $29,900 in the US. It will also be coming to the UK, with Absolute Sounds responsible for distribution.